Many types of hard cheese make good Parmesan replacements. 4 Can You Eat the Skin on Muenster Cheese? 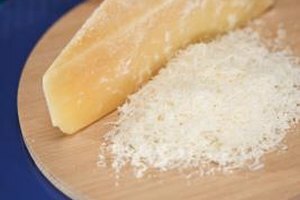 Parmesan cheese is served shredded on pastas and salads, used as a topping and recipe ingredient when grated and sliced Parmesan nicely complements fresh or dried fruit and bread. It's made in northern Italy as well as in the U.S. and has a salty, pungent flavor. Parmesan has several substitutes, all with similar flavors and long shelf lives. Sweeter than Parmesan, Asiago is a good substitute. You don't have to spend a lot on the imported variety as the domestic ones are just as tasty. Buy the aged version because fresh Asiago is semi-soft, has a much different taste, and isn't good for shredding. Romano cheese has a saltier, sharper and nuttier taste than Parmesan. American-made varieties are passable but if you can find imported pecorino Romano, made from sheep's milk, caprino Romano, a goat's milk product, or cow milk-based vacchinio Romano, it's worth the extra cost. Grana Padano is imported from a different part of Italy than Italian Parmesan. You can shred it just like Parmesan and it's often less expensive than other imported hard cheeses. If you're looking for a low-fat Parmesan replacement, sapsago is a good choice. Imported from Switzerland, it's good for grating and has a distinct color and flavor imparted by a cloverlike herb during processing. Latin markets usually sell Cotija cheese, also called queso anejado. Cotija is a hard, white cheese with a sharp, salty flavor. It grates well but doesn't melt, so only use it in cold dishes or as a cold topping cheese. Queso anejado is another type of Cotija that grates well but is covered with a red chili paste, so only shred it for use in spicy dishes. Another Spanish cheese, Manchego, sometimes labeled as queso Manchego viejo, has a darker yellow color than Parmesan but has a similar flavor. It's also sold fresh but only buy the aged type for shredding. Jack cheese is sometimes called Monterey Jack for the California city in which it was first made. The soft version has a low melting point but dried or aged Jack has a texture and flavor comparable to Parmesan. If you prefer a nondairy Parmesan substitute, try a soy Parmesan cheese. All brands are free or cholesterol and are available with no fat to low and moderate amounts of fat.